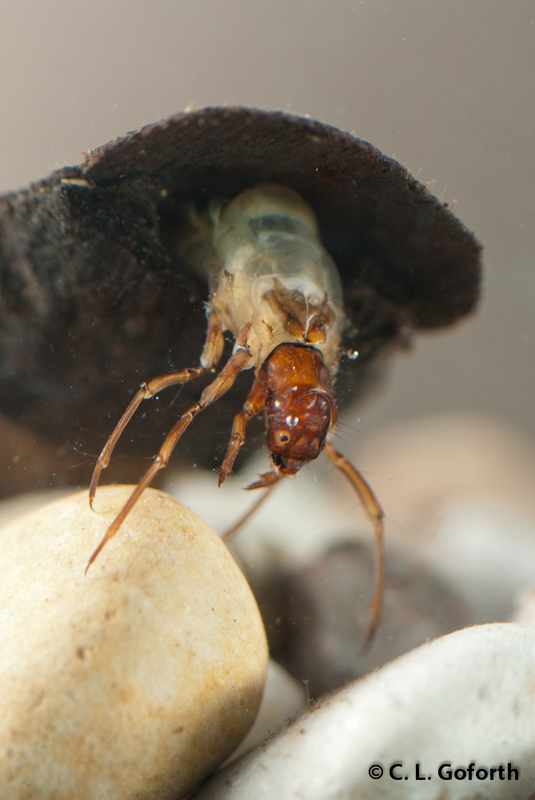 Over the past few years I’ve had several people ask me how I photograph aquatic insects. I think it’s time I share my method! Hope this will help some of you take some amazing aquatic insect shots – and I hope you’ll also share links to your own aquatic insect photos/photo setups so we can all learn from one another. I’m sure my method isn’t the best out there, so I would love to hear about alternatives! For the first few years I had my blog, most of the aquatic insect photos I took were either taken with a camera mounted on a microscope or in a white bowl full of water. Either method works okay, but there are major problems with each, especially with the equipment I had to work with. I got a few decent shots with both, but I never got the kind of jaw-dropping, awesome shot that I was hoping to get. I was beginning to despair. Then I went to Bug Shot in 2011. There I had a conversation with Stephen Maxson. He showed me some of his amazing aquatic insect photos and how he set up his equipment to take the shots. It looked easy, so I was eager to try it out when I got home. It was revolutionary! Suddenly I was getting a lot closer to getting the kinds of shots I wanted of insects in water. So, thank you Stephen Maxson for teaching me your method! And if you reading this ever have a chance to see any of his photos (he posts them on bird forums, not a blog or a personal website, and I am having a bear of a time tracking one down to share…) I know you’ll enjoy them. It’s really simple! Just a small aquarium, a couple of diffused flashes set on either side of the aquarium, and something to prop up a background with. I use a small photo album for the latter, and use either a piece of fabric or paper as the background. You can also print indistinct, blurry images of pond plants or other natural scenes to use as a background for a more natural look (what John Abbott does for his awesome aquatic insect shots! ), but I personally like using solid colors. Totally up to you and your personal tastes! The aquarium is the most important part. In my experience, you want to keep the insect as close to your lens as you possibly can, so minimizing the space in which the insect can move is a plus. You can either use a piece of glass or Plexiglas to push the insects toward you in a purchased aquarium or make your own. 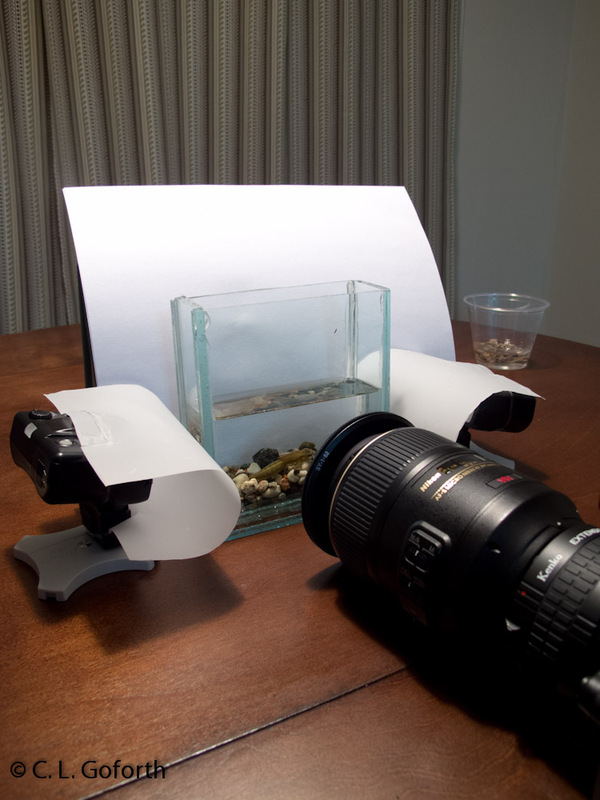 I used the custom aquarium you see in the photo for some research I did in Arizona and found that it worked marvelously for photographing insects in water. I built a similar one as soon as I moved to North Carolina so that I could continue photographing my aquatics. Building a custom aquarium is simple: just buy some glass, have someone cut it to the size you want, and assemble the pieces with aquarium sealant. Easy! My only piece of advice is that you use thinner glass than I did (1/4 inch). The glass isn’t perfectly clear, so between that and the water, there are always distortions in the photos I take with my custom aquaria, both the ones I left behind in Arizona and the one I built here. Thinner glass is more fragile, but should result in sharper images. Diffusing the light is important as well so you don’t have a harsh, bright glare glinting off your bugs. I use Alex Wild-style diffusers, little sheets of frosted white mylar. I connect them to my Nikon R1 flash system flashes with nylon ponytail holders and then set them on their stands on either side of the aquarium. That way, you have light shining on the insect from both sides and can eliminate as many of the shadows as possible. My flashes are tiny, so I have to bump the intensity up, but they’re conveniently wireless. If you have a Canon or other camera, you may need a remote flash trigger to make this work. Then it’s just a matter of propping a background up behind the aquarium, filling your container with water (I used filtered whenever possible to keep the water as clear as I can), dropping the insect in, and snapping some photos! You can add other pondy things to the water to make it look more natural – larger rocks, algae, floating vegetation, cattails/reeds, etc – or you can leave the water clear. The more stuff you have inside, the less light is likely to hit your subject, so I tend to leave the water clear. But then I also don’t like to have the clutter of other things in my shots. Again, go with whatever works for you! 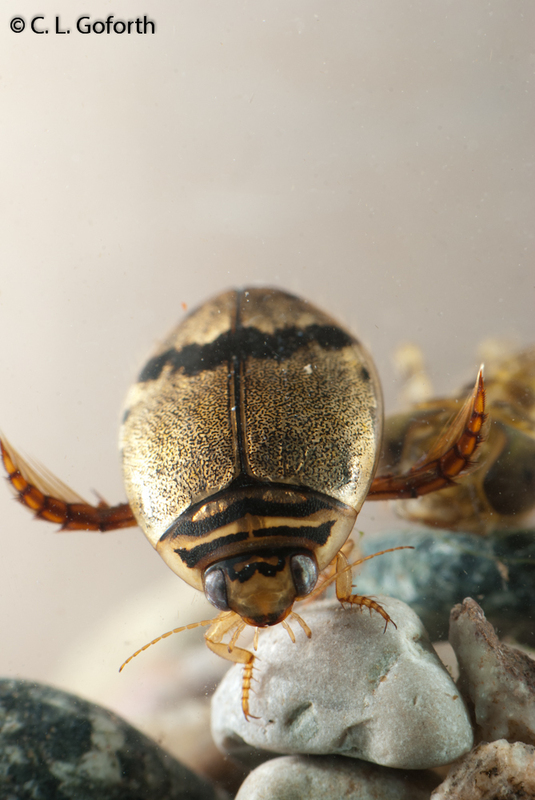 Predaceous diving beetle, Thermonectus nigrofasciatus. 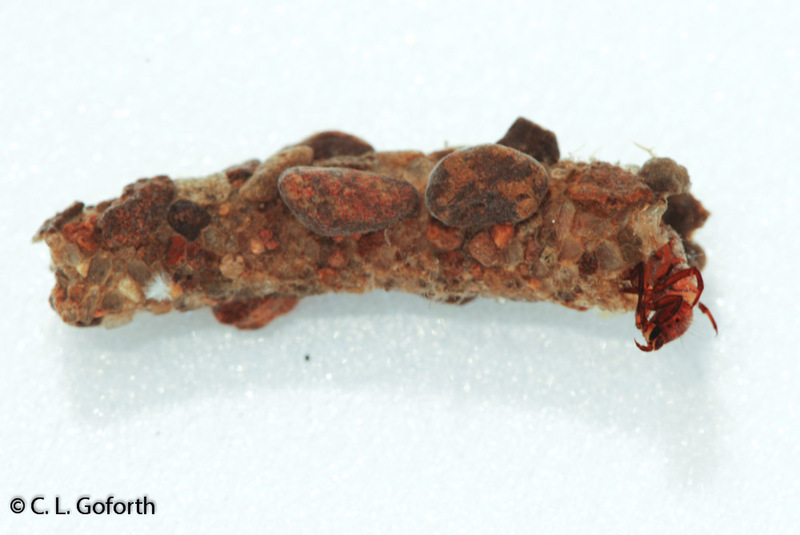 The caddisfly Phylliocus aeneus wandering around the rocks. The insects look SO much better in the aquarium, shot through the side with soft, diffused light, than I could ever manage with my microscope or bowls. I am still no Jan Hamrsky and there’s always room for improvement, but I think at this point I’m going to focus on improving the glass in my aquarium rather than adopting a new setup because I like this one. It’s easy to use, relatively portable, and produces nice images – it works well for me and my style. If you have your own setup for aquatic insects, I’d love to hear about it! Just leave a comment below and tell me about your setup. And if you haven’t ever tried photographing insects, give it a shot! I think it’s a ton of fun, so see what you think. I hope you’ll enjoy it as much as I do! Really enjoyed your tutorial – whilst insect photography is not something I have done, I found this really interesting :) thanks! Insect photography is addictive! Once you start, you won’t be able to stop, but it’s also a ton of fun. I highly recommend it! That is very inspiring! I should try this myself….Thanks for the awesome idea! You should! It works great and you can get shots of insects that few people bother trying to photograph, so I say go for it! Wow. You make it sound so easy. I have a relative sense of the size of the aquarium, but could you provide the dimensions? I am particularly curious to know how deep it is. Are you using extension tubes with your lens? Which lens are you using? The aquarium I’m using now is 5 inch by 5 inches by 1/5 inches, so pretty small. I’m using a Nikon D80 camera with the Nikkor 105mm macro lens for these shots, and sometimes with one or more of my Kenko extension tubes. I’ll be posting some photos on Friday that I took recently that used just the 31mm tube. Hope this helps! Thanks so much for the additional info. I may be inspired to try something like that myself. You’re welcome! Would love to see what you come up with! Hi, thank you for mentioning my work. Allow me to confirm the above mentioned practices and supplement them. Thinner glass really results in sharper images. Very important is to take the pictures precisely perpendicular to the glass to minimalize the distortion. The flashes on the sides of the aquarium are great for bringing additional light for more natural lighting from the top. The size of the aquarium is also important. In small ones it is easier to take the pictures. The bigger the aquarium is the better you can adjust the conditions for the insects to behave naturally. You’re welcome for the mention! I love your work, and I’m really excited that you took the time to comment. Hope I can make others appreciate your photography as much as I do! Thanks also for the suggestions. All good points! Hope it will come in handy for you sometime! I’ve always toyed with the idea of using fiber optic lights that way, but have stuck with either leaving the flashes attached to my camera and photographing things one white backgrounds (a sort of pseudo-white box) or using a white box. Now that I’ve seen an example of what they can do, I might rethink my technique for the terrestrials a bit. Thanks for the tip! And I am glad you like the post. You’re welcome! Hope they come in handy. Great post, I’d never heard of anything like that before. 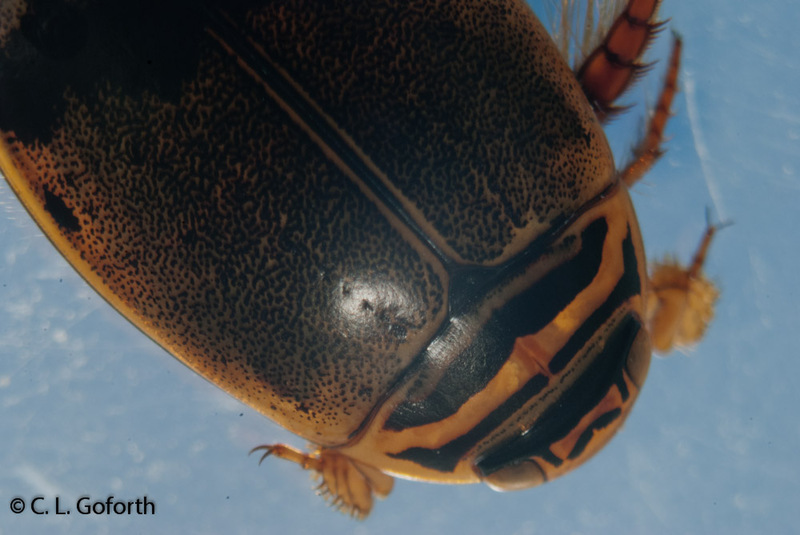 Thank you for sharing how you photograph your insects. Loved the beetle! You’re welcome! And I have to admit that I’m rather fond of that beetle as well. It’s one of my all time favorite shots, but part of that is because it’s one of my all time favorite beetles too. Glad you like it! Great stuff. I bookmarked it. I’m at the “bugs in white bowls” stage, and I actually love some of the images I got of dragonfly larvae this way, but I like your set-up, too. I didn’t really mean to sound like I think the white bowl stage is a bad one – I got some GREAT photos of some of my insects in bowls! It just has its limitations and you can overcome some of those with other methods/setups. Keep doing the white bowl if it works for you! All that matters in the end is that you’re getting shots that you like. Hope you’ll find it useful! And I’ll try to get some shots of caddisflies for you, but I don’t have easy access to a very large diversity of them at the moment. All we’ve got in the stream at work are glossosomatids, and I think only one of those. Going to collect some tomorrow, so maybe I’ll get some photos of them up soon! Fascinating and impressive. Thank you! Thanks for the post! How do you handle water bubbles on the insect and tank? Also, do you edit out scratches on the tank and if so how? Thanks a bunch! I leave the water in the tank for a day or two before I put the insects in whenever possible. Most of the bubbles dissipate overnight and then I give the water a stir and put the bugs in. I let the bugs and the water settle for about an hour and then start taking photos – results in settled bugs, few bubbles, and clear water. Works pretty well for me, though sometimes I’m impatient and just stick the bugs in immediately after putting water in the tank. Then I have to edit out bubbles or deal with the fact that there are tons of them in my photos. Being patient is a lot less work than editing out bubbles, so I really try to go that route whenever I can. The side-lit photos look so great! I really like the beetle photo.